As One Degree’s Resource Manager, I am responsible for maintaining, collecting and organizing the thousands of community resources featured on our site. It’s no easy task as our database continues to grow and the range of resources expands everyday. My primary job is helping our members easily find the resources they need every time they come to One Degree. The recent redesign of our site created an opportunity for us to improve the way we categorize and organize our resources. We went back to the basics. At One Degree, our resources — what we call “opportunities” — are categorized by “tags,” and attributes about each resource are defined by its “properties.” For instance, an opportunity like “Get free door-to-door transportation for disabled seniors over 80” is tagged as “transportation assistance,” with a community property of “seniors” and “people with disabilities.” Using this system, our members can filter by the “transportation assistance” tag and the “seniors” property to get exactly the senior transportation resources they are looking for. We group resources by type rather than for whom the resource is intended. However, over time our tags and properties started to overlap; we were breaking the very rules we created! For example, the “veterans job placement” tag was confusing because we also had a “job search” tag. Which tag should a veteran use to start their search? We decided to remove all tags that denote specific communities or audiences to reduce confusion. (The exception is when a tag’s resources are only for the audience in its name, such as “childcare.”) In this veterans example, we moved these resources to a new tag “Job search & placement,” and then created a new property for those who are veterans. The result of our changes is several new community properties you can use to filter, including veterans, military families, refugees, immigrants, pregnant mothers, domestic violence victims and survivors, previously incarcerated individuals, transitional age youth, and individuals with HIV/AIDS. One Degree features a new resource area for organizing employment opportunities. No one-size-fits-all tags. Resources come in all shapes and sizes. Our resource tags need to accommodate the growing diversity of opportunities in our database and surface many different types of services. 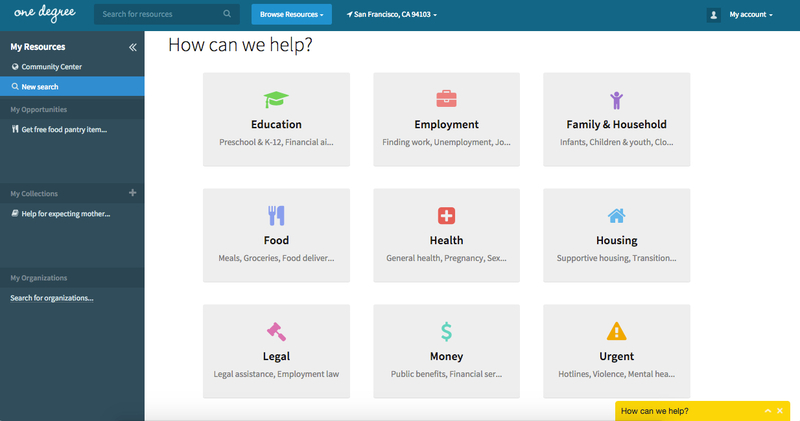 We unveiled a new area for employment resources. The “Employment” area features interview and resume help, job training, unemployment, career counseling and small business resources. We also created a new pregnancy category under “Health” for resources in prenatal care, birth preparation, pregnancy tests and abortion. Another improvement we made was updating tags to better describe services in colloquial language so it’s even easier for a family to find exactly what they need. Tags like, “Summer & holiday meals”, “Anger management”, “Section 8” and “Criminal record help” make it more straight-forward to locate specific resources that have grown in popularity on our site. It’s important to note that changes to our tags affect any previous search you may have bookmarked. If a search was made with tags that were replaced you will need to create a new search using the new tags. As One Degree continues to expand in 2016, I’ll be working on many more exciting improvements to the maintenance, collection and organization of our resources. While we believe these changes are important steps in making it easier and quicker for our families to find the right resource each and every time, it’s just a start. I’d love to hear your feedback — email me at audrey@1deg.org. You can view our full list of tags here and full list of properties here.